Google Drive will offer up to 100GB of cloud storage when it launches, insiders have claimed, with a public unveil of the multimedia and document store potentially as soon as today. The 100GB maximum will be for paid accounts, Reuters‘ sources say, with free accounts sticking to the 5GB we’ve seen rumored before. However, there will also apparently be new search tools to help sift through all those gigabytes of data.Google will supposedly implement “sophisticated image search technology” which will allow searching through multiple document types. That won’t just include photos, but PDF files too, apparently. It’s possible that Google could be using some sort of optical character recognition, similar to that found in Evernote, which identifies text in images and thus allows it to be indexed for searching. Pricing for the various levels of paid account is yet to be revealed, and it’s unclear how many tiers Google will eventually offer. However, the search giant is expected to be aggressive with its costs, using its existing data center heft to challenge Box, Dropbox and others already in the market. 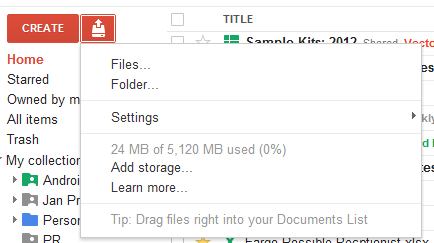 More evidence mounts up that Google Drive is set to arrive sooner rather than later. Engadget notes that Google Docs is now showing a 5GB upgrade, bringing it in line with the expected entry-level Google Drive storage, while The Verge spotted new Google support documents instructing how Docs ownership can be rolled over into a new Drive account. The Android app has already been caught in the wild, apparently, though Google itself has declined to comment on the cloud rumors.